ith an abundance of A-list cinematographers and plenty of opportunities for glorious appearances from the stars of showbiz today, notable dates on the international film calendar, few events rival the spectacle and power of Cannes Film Festival. To celebrate the acclaimed French festival we pay a tribute to Jean-Luc Godard’s typography. “To me watching the films of Jean-Luc Godard is like watching a white Rauschenberg painting or listing to John Cage’s 4:33: it isn’t something I do for entertainment” writes Christian Annyas, a typophile who has seen her share of movies over the years. “They’re historically significant because he broke all the rules in the book” he adds. “It’s quite interesting to see the designs evolve. In this digital age it’s refreshing to see type that isn’t made on a computer: the imperfect and handmade look of the letterforms, the bad kerning, the large gaps between letters and words, the justified blocks of text, the awkwardly dotted capital I’s. Even when he used an existing typeface – like Antique Olive in ‘Week end’ (1967) – the letterforms look as if they were cut out with an Exacto knife. 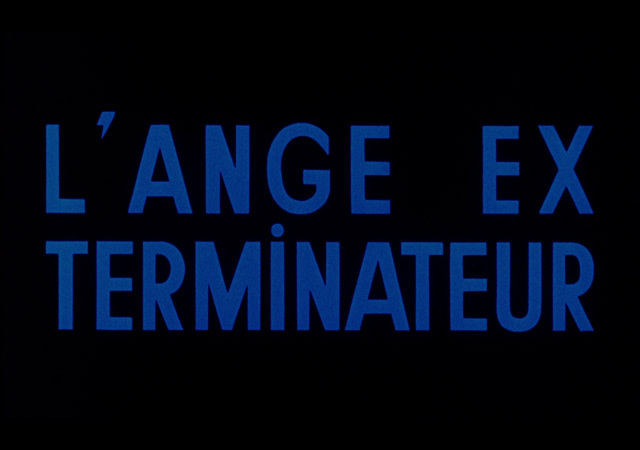 Sauve qui peut (la vie) (1980) is the last film featuring custom typefaces. In his later films Godard used existing typefaces like Futura, Univers, Helvetica and Garamond”. Jean-Luc Godard is best known for his involvement in the influential film movement La Nouvelle Vague or New Wave during the 1960s. Godard’s liberal use of typography -from the opening title sequences, through the intertitles to the end (“Fin”) titles- is striking. Just like his films. Bold and beautiful, “the type for the film titles have a subtle yet charming ruggedness about them, the words look almost hand-drawn or as though the letters have been cut out with a scalpel and these imperfections give it a feeling of identity and craft” writes Tom Jarrett. “The type is often large and commanding, in some cases it is layered over the top of the films but in a considered manner that also frames the shot. The type is sometimes animated with a sense of playfulness, for example in the opening titles for Bande à Part. Even though French New Wave stood for spontaneity and going against cinematic standards, it also adhered to certain consistencies which can also be seen in the selection of title designs below. Simple impactful type was used and with a color palette that mainly consists of the red, white and blue of the French flag. The words are sometimes broken, obscured or flipped out of position and often with wild kerning, yet the type always remains flat and legible. This natural and playful style has stood up to the test of time and is still as sharp as it was 50 odd years ago” he adds. Godard’s career began in 1952 as a writer and critic for the esteemed film magazine Cahiers du Cinéma. It was here that the auteur alongside Éric Rohmer, Jacques Rivette, Claude Chabrol, and François Truffaut, reinvented what cinema is all about.